Art, poetry, music, theatre…and a time to raise – matching – funds for Creations for Parkinsons TEAM FOX… – Ce Soir Arts – Be inspired tonight! Even during these past several months as we’ve been taking it a bit slower than 2012 and earlier in 2013, we do like to be busy at Ce Soir Arts. Wonderful artists such as Owen Landar – who shared his newest (and quite astounding) photographic art with us in December 2013 – and Carlotta Ceawlin – whose lovely, mystical landscapes are on exhibit this month at both The Gallery and The Conservatory at Ce Soir Arts – are part and parcel of what we strive to do here: share beauty, express grace, have fun, and inspire creativity. Well, folks, we’re getting ready to do just that this coming Friday, when one of our fave shows – FAB Friday – will return, this time featuring six of SL’s finest musicians offering 30 minute sets to raise funds for Creations for Parkinsons TEAM FOX. To say that we are thrilled to be hosting this event would be an understatement. Like many people, we have someone near to us affected by Parkinson’s and are aware of its sometimes very serious manifestations. Fortunately, our friend is being effectively treated and is doing quite well – and that is testament to the outstanding research being done. The Michael J. Fox Foundation is funding many excellent research projects, and we want to help. So…come on over on Friday for three hours of outstanding music, rip-roaring fun (you HAVE seen the line-up, yes? ), and an opportunity to make a real difference in the lives of many people – both now and in the future. Here’s the deal: 1) You come over and enjoy the shows. 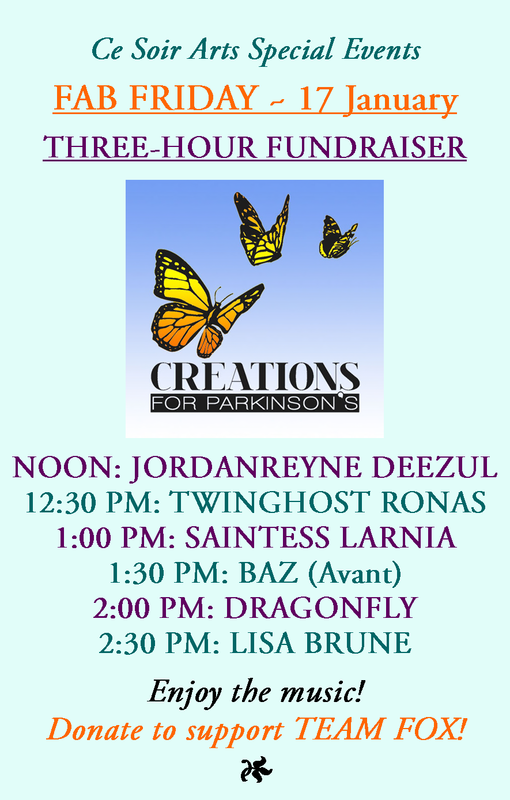 2) You donate as much as you can to the charity-dedicated kiosk that Creations for Parkinsons founder Barbie Alchemi will have out (remembering that every single $L makes a difference). AND 3) I’ll match what you give, every half-hour, up to $L2,500 every 30 minutes. Whatever has been donated in each 30-minute timeframe will get doubled – right then and there. Simple! So come on over and break my bank! Here’s the lineup for FAB Friday…don’t miss it! Join us on FAB FRIDAY to support Creations for Parkinsons TEAM FOX! Next Thank you! FAB Friday was…FABulous!